The radiology division at Children’s Hospital of Pittsburgh of UPMC is one of the largest pediatric radiology services in the country. The department also provides neonatal radiology services at Magee-Womens Hospital of UPMC and general radiology services at North, East, and South Childrens ambulatory care centers. Subspecialty-trained pediatric radiologists, who also comprise the Pediatric Radiology Division conduct more than 130,000 procedures annually, including MR, CT, X-ray, fluoroscopy, ultrasound and interventional procedures. Children’s Hospital of Pittsburgh of UPMC is equipped with four ultrasound units, two radiographic and fluoroscopy units, one interventional radiology suite, and five radiology rooms. 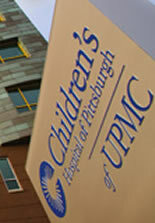 In 2009, Children's moved into a new, state-of-the-art, 263-bed hospital in the Lawrenceville section of Pittsburgh. In addition to the hospital, the new facility houses a research complex, ambulatory care center as well as faculty and administrative office space.